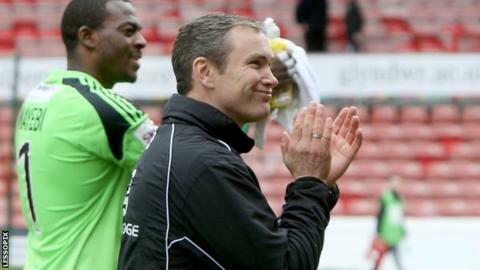 Manager Kevin Wilkin wants Wrexham to build on their 1-0 win over Macclesfield and finish the season on a high. Wilkin celebrated his first win in charge of the Dragons after Johnny Hunt's early goal secured victory. The win eased any relegation fears with four games of the Conference Premier season remaining. "It's something to build on. I want to try and finish with a flourish if we can," Wilkin said. "I want to get as many points as I can on the board and I want people to keep showing the right desire and the right attitude from now until the close of the season. "It's most important that we finish for those supporters with a run of results to take us into next season." While Wilkin is keen to end the season on a high, he says he will use the remaining games to cast his eye over Wrexham's squad. Only five members of Wrexham's current squad have contracts for next season and Wilkin has yet to sit down with individuals to discuss new deals. "It opens doors for me to perhaps take a measured risk with people and have a further look at one or two," Wilkin added. "I want to give people opportunity and there are several waiting in the wings that would love an opportunity. "It's a balance really. I want to win games and that's what I'm about. "Whilst I don't want to throw caution to the win with it all I want to put people into a set-up that we've got a chance of winning games rather than stick people in there for the sake of doing it."